Place eggs in a sauce pan and cover with water. Add a dash of salt and 2 tablespoons of white vinegar per quart of water. I used about 2 tablespoons of vinegar in this saucepan shown. I will admit that I don’t actually measure the vinegar and just eye-ball it. Boil eggs as you normally do for hard boiled eggs. Rinse in cold water after cooking. 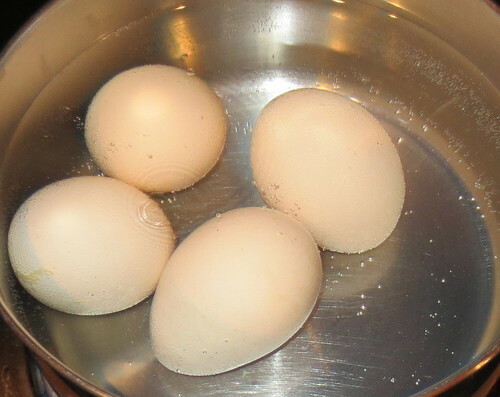 The results are that your shells are much softer using the vinegar and do peel much easier. I hope you will try this useful idea. Let me know your results.